This guide is the first part of Blackram Supply Chain (6/4 player). The first part is mainly to introduce this Dungeon and the two phases of fighting with Gatekeeper Slashimi. And the second part is the three phrases of fighting with Poharan. 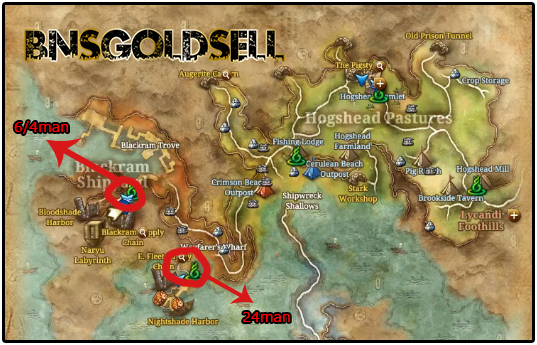 In Blade & Soul, Blackram Supply Chain is located in the Blackram Shipyard - Hogshead Pastures, Moonwater Plains. You have to complete Act 3 - Chapter 13 quest - commanders Shadow to gain access to this dungeon. Once you have completed this, you will receive a quest - Invitation from Poharan which allows you to access to this dungeon. Below map is attached for specific details. When entering the dungeon, you just head towards to the first pilar of the left hand side. Run past the first area of mobs until you meet the first boss. If possible, try to go as team. If players get caught by mobs, kill them and go forward. The first boss is Gatekeeper Slashimi. Here I am kindly to remind a Dragonheart cost 1 Naryu Coin each, if you want to grab one, you should know the cost. To fight with Gatekeeper Slashimi, you have to deal with two ads and two phases. To deal with the ads, you can use below ways. 1.If there is a summoner in your party, by using its curl ability, you can use its cat to tank them. 2.Make one of your team members to off tank them. 3.Kill them together with AOE and then move onto Slashimi. The above three methods can be used to deal with ads in any boss fight. Then pick whatever your party feels comfortable with. Then you will receive a quick not regarding the ads, which requiring a double CC effect to be stunned like Slashimi does. If there is someone in your party tanking the ads, let him a little away from the main group since the ads can do a light AOE attack which can make a lot of damage. As for how to fight with Gatekeeper Slashimi, I divide it into two phases. If you want to buy Blade and Soul gold, BNS gold is a good choice! At this stage, Slashimi will use a couple of different attacks against you, such as, standard sword attack; twice forward stab attack and it will knock you back once you get caught in it; 360° AOE cleave . Water bolt: You will receive 4 water bolts from him. By using skills like iFrames or Blade Master’s block, you can completely avoid these. Water boil: Slashimi boils all the water area where you are fighting with each other during this attack. You will get 3 ticks of damage if you get caught in it. If you have a Force Master in your party, you can use their ice flower skill which can freeze everyone in the party and negate all damage to avoid this. Or you can avoid this just by using iframes. Charge attack: after the water boil, you will receive random charge attack through out the room. You can use a counter skill to stop him using his tracks and make him stay still. Destroyer shield, Blade Master Block and Assassin decoy are the counter skills for your reference. After these three different attacks, Slashimi go back into phase 1 and start to cycle again. It is kindly to note you this fight has a timer, and once the cycle begin to run, it runs three times. Moreover, he will go into enrage mode, which makes you have to fight in party. Therefore, you must kill him before the cycle begins. Once you kill him, go forward and run past everything till you gliding forwards to the next area. After you have landed, just run part everything into the tunnel and you will go to the next area.